The New York Times will hold an event with Sen. Bernie Sanders (I., Vt.) Wednesday aimed at getting college students to vote in the upcoming midterm elections. The event, called "Turn Up The Turnout With Bernie Sanders," is part of the Times‘ "Get With The Times" lecture series. The democratic socialist Vermont senator will sit down with Times reporter Alex Burns at the University of Maryland for a live-streamed discussion, with watch parties planned at universities across the country. 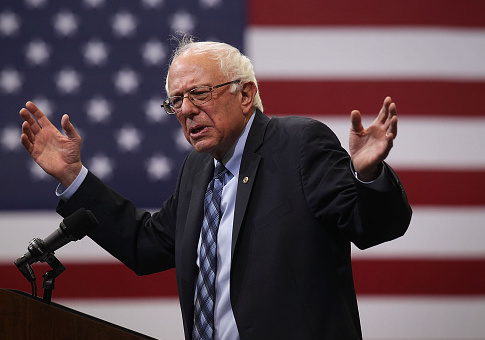 Despite the involvement of Sanders, the event is billed as nonpartisan. "With the midterm elections just months away, Senator Sanders will take the stage to discuss what's at stake for students in particular, and to amplify the critical importance of voting — regardless of which candidate you support," reads the event description. The Times is partnering for the event with Rock the Vote, a nominally nonpartisan youth get-out-the-vote organization. In practice, Rock the Vote has a long history of favoring liberal and Democratic causes, including sending out mock draft notices from Donald Rumsfeld, then President George W. Bush's secretary of defense, to young voters in 2004 and denouncing the results of the 2016 election. In response to questions from the Washington Free Beacon about Rock the Vote's involvement, the paper noted the nonprofit "bills itself as a non-partisan organization." The Sanders lecture is the sixth in the "Get With The Times" series aimed at college students, following lectures from comedians Trevor Noah and Chelsea Handler, Hamilton actor Leslie Odom Jr., "The Handmaid's Tale" actress Samira Wiley and former Teen Vogue editor Elaine Welteroth. When asked by the Free Beacon if there were plans for get-out-the-vote lectures or similar events with conservative politicians, the Times responded they were "in conversations with others from differing political viewpoints." This entry was posted in Politics and tagged 2018 Election, Bernie Sanders, The New York Times, University. Bookmark the permalink.